If there is one area of life most people can change in order to return to the Shire, in a metaphorical if not literal sense, it’s their eating habits. You can live in a 20-storey high-rise in Manhattan or Paris and still adopt a Hobbit lifestyle when it comes to eating. That’s because Hobbits are different from most of the enslaved subjects of Mordor not only in what they eat… but also in how and why they eat it. Hobbits, along with most of the free peoples of Middle-earth, eat pure, naturally-grown, mostly wild foods from their own gardens or nearby fields: lush berries, fresh bread, cheese, cold meats, mushrooms (lots of those! ), wine and beer. They eat frequently, usually in groups and often accompanied by poetry readings and songs. Hobbits are not vegetarians but they have a varied diet of whole, local foods, including Nimcelen, the hobbit version of potato salad; Soroname, a warm soup filled with pasta, meat, tomatoes, beans and onions; and Lembas, Elvish waybread. They drink wine and, when they can get it, such invigorating liquors as Ent-draughts and Miruvor, the life-giving and energizing elixir of the Elves. Food has a spiritual as well as a biological purpose for them. They were washed and in the middle of good deep mugs of beer when Mr. Butterbur and Nob came in again. In a twinkling, the table was laid. There was hot soup, cold meats, a blackberry tart, new loaves, slabs of butter, and half a ripe cheese: good plain food, as good as the Shire could show, and homelike enough to dispel the last of Sam’s misgivings (already much relieved by the excellence of the beer). In Tolkien’s vision, the growing, preparation and enjoyment of food take up most of the hobbits’ time—and serve a much higher purpose than the mere utilitarian re-fueling of Mordor’s orcs or modern society. The meals of the hobbits and the elves have social, even spiritual, purposes, helping to cement the bonds of friendship and strengthen the soul for hardships to come. In this, Tolkien is echoing an ancient spiritual tradition that extends back through his own Catholic faith, and the Anglo-Catholicism of his friends at Oxford, all the way through the Jewish and Christian testaments. The elaborate family Sabbath and Passover meals are central to Jewish religious practice. The central act of Christian worship in the majority of denominations, the Eucharist, is essentially a ritualized meal and a re-enactment of the Last Supper. To put it simply: What and how we eat matters… and there is a vast chasm existing between the nourishing, fresh, locally-grown food eaten in the Shire (and in most traditional societies)… and the manufactured, pre-packaged, artificial “food products” consumed by the harried worker-bees of consumer society. Ironically enough, the growing and eating of food also provides a startling case study in just how radically different is the social and economic vision that informed Tolkien’s formative years—the Third Way de-centralized economics of G.K. Chesterton and his circle—and the dominant economic paradigm of our own world, the literal fusion of Big Government and Big Business in the modern corporate state. That’s because at the heart of Distributist or Third Way thought is a belief in radicalde-centralization, diversity and local control—particularly when it comes to the production of food. In contrast, the very essence of modern industrial food production is centralization, lack of diversity and national or corporate control. In the early 20th century, there were approximately 6.4 million farms in the United States producing food for a population of 76 million people. By the year 2008, that number had fallen to just 2.2 million producing food for 300 million in the U.S. and for tens of millions more abroad. Even those statistics don’t tell the real story of consolidation and monopolization, however. That’s because most of the “independent” farms that still exist are really controlled by a handful of agricultural conglomerates—aided and abetted by Big Government regulators, such as the U.S. Food and Drug Administration. Big Business and Big Government work together to create regulations supposedly for the public’s benefit but really designed to put small competitors out of business. As a result, by some estimates just four companies now produce 90% of the food consumed in the United States: Cargill, Tyson Foods, General Mills and Kraft. The success of global agribusiness is well known. In some ways, it’s a triumph of modern science and technology. Beginning in the 1920s, large agricultural conglomerates began applying the techniques of the Industrial Revolution to the growing and marketing of food. In place of diverse crops and animals grown in a variety of places, the big companies began a program of standardization, mechanization and centralized control. Efficiency became the prime directive. In place of small family farms dotted across the landscape, a handful of enormous factory farms were created that produce assembly-line “food products.” The goal was to produce vast amounts of standardized foods at extremely low prices… and the big conglomerates, with the help of government subsidy programs and regulations tailor-made for big companies, succeeded beyond anyone’s wildest dreams. Thus, the twin forces of globalization and industrialization have created an enormous and inter-dependent multinational food industry that has resulted in supermarkets, at least in prosperous First World countries, being stuffed full of seemingly limitless amounts of pre-packaged “ready to eat” foods. A typical North American or European family is a virtual United Nations of food consumption, eating “beef products” produced in Argentina, coffee grown in vast plantations in Columbia, wheat grown in Nebraska, and strawberries from Turkey. But as many food analysts have pointed out, the diversity that appears on store shelves is really anillusion carefully designed to mask an ugly truth: mass standardization. While there may be dozens and dozens of different “brands” of cereal on the shelves, mostly owned by the same one or two corporations, the underlying reality is that what’s inside the boxes is virtually identical. The negative health consequences of this relatively monotonous diet of pre-processed food products are only recently becoming apparent to average people. 1. High-yield, genetically-modified (GMO) fruits and vegetables grown in depleted soils drenched in pesticides, picked weeks early and filled with chemical dyes and preservatives so they arrive in stores looking “fresh”. 2. Corn- and animal-fed industrial meat products filled with potentially dangerous synthetic antibiotics (such as Zeranol, Trenbolone, and Melengestrol) and growth hormones—BANNED, for health reasons, from the European Union. 3. Dairy products, from milk to ice cream, produced from cows given a genetically-engineered hormone called rBGH to increase milk production. 4. Refined carbohydrates designed for maximum shelf life rather than nutritional content. 5. Laboratory-created “fat substitutes” that were designed to pass through the human bodyundigested. 6. Synthetic “instant” fast food products pumped full of chemical preservatives, partially hydrogenated oils and High-Fructose Corn Syrup (HGCS) to increase hunger and encourage increased consumption. The result is a tragic paradox: Despite record levels of obesity and despite gobbling fistfuls of chemical vitamins, millions of people in the industrialized west suffer from real nutritional deficiencies without even knowing it. 2. The extremely low rates of these same chronic health problems among traditional peoples who don’t eat from tin cans or plastic boxes. The first set of facts has been known for decades. Beginning about 1920, about the time when industrialized farming and the use of chemical fertilizers and pesticides by crop dusters became common, the death rate from heart problems in the U.S. more than doubled and the death rate from cancer nearly tripled. At the same time, Americans also became afflicted with dozens of other ailments almost unknown to their grandparents and great-grandparents, including numerous food allergies, autoimmune ailments, joint problems, chronic breathing difficulties, migraine headaches, sexual infirmities, and the list goes on and on. The truth is: Thanks to improvements in medicine (antibiotics) and public hygiene (sewer systems), Americans today live longer than their pioneer ancestors but are sicklier, weaker, and prone to health problems that didn’t even exist in 1900. A second set of facts is even more alarming. Traditional societies that remain isolated from modern industrialized farming remain remarkably healthy, virtually free of the chronic health problems that plague modern North Americans and Europeans. The typical response to this has been that “primitive” peoples simply didn’t live long enough to get such “western” ailments as cancer and heart disease. But we now know that this is not true. A recent study of longevity among the few remaining hunter-gatherer societies—such as the Yanomamo in the Amazon rainforest or the Kung people in Africa—found most traditional peoples live almost as long as their western counterparts, despite their utter lack of modern medical care. What’s more, when doctors examine the older members of hunter gatherer peoples, they find that they are largely free of the diseases that plague modern Americans. What Pollan and other nutrition researchers now believe is that the recent explosion of chronic health problems in developed societies is due almost entirely to the nutritional deficiencies of modern industrial food production. To put it simply: Modern industrialized farming and mass-production meat factories have tradedquantity for quality. For convenience and shelf life, the giant food companies inadvertently strip out the vital plant nutrients that keep you strong and healthy—and, in their place, pump in synthetic sweeteners, chemical preservatives and other additives. This makes abundant “food” that can last almost indefinitely on store shelves, but which lacks almost all of the vital nutrients you need for health, healing and longevity. Pollan and other food researchers claim, therefore, that it almost doesn’t matter what your specific diet is—the fish-oriented diet of Greenland, the Mediterranean diet of Greece, the rice diet of Japan—you will be far healthier eating that way than eating the processed foods of modern developed countries. How the food is produced turns out to be far more important, in terms of its effect on your health, than what you eat! Put another way, you’d be better off eating organic whale blubber every day than you would eating frozen pizzas. Increasingly, medical researchers are agreeing with this assessment. Research now links poor or inadequate nutrition to four of the top 10 causes of death in the developed world: heart disease, cancer, stroke, and diabetes. Research done by the Center for Nutrition Policy and Promotion found that a staggering 74% of Americans suffer from inadequate nutrient intake. Another study found that only 41% of the U.S. population gets enough phytonutrients from vegetables and only 24% get enough from fruits—and of some vital phytonutrients, such as the vision-supporting nutrients found in yellow vegetables like squash, they get almost none. In other words, the harried citizens in modern industrial democracies have access to vast amounts of what looks like food yet are suffering from nutritional deficiencies that are seriously undermining their health and even shortening their lives. As you might expect, the early Distributists, writing in the 1920s when large industrial farms were just being created, foresaw this development clearly. They advocated a return to family-owned farms (not necessarily small) for financial, spiritual, political and health reasons. An early Distributist manifesto was even entitled Flee to the Fields. They maintained that a decentralized system of food co-ops and farmers’ markets, seen in Europe for generations, was the best way to ensure the security of food production and quality. In this, they were a voice crying in the wilderness, dismissed as “anti-modern” and old-fashioned. Distributist thinkers such as G.K. Chesterton and Hilaire Belloc believed that modern political parties of the Left and Right were essentially different sides of the same coin: Marxists and Fascists, Democrats and Republicans, Labour and Conservative, all believe in big factories, standardization, uniformity, centralized control and mass production. They just quibble over who should be in charge, government bureaucrats or corporate executives. Stalin and Mao created vast industrial farms every bit as large and uniform as those of ConAgra and Tyson Foods. Distribustists, in contrast, have been the only serious movement to question the orthodoxy of the modern corporate state, to insist on decentralization over centralization, local over national control, diversity over uniformity, smaller over bigger. In this, Distributists are quite in harmony with the growing local and organic food movement, a movement that is embraced by people across the political spectrum. While many people associate local and “slow food” efforts to be pre-eminently left-wing and hippie-like ideals, many conservative and libertarian-minded folks also embrace the same ideals. One reason for this is because there is a growing awareness among ordinary people that large-scale industrial farming, controlled by a handful of agribusiness monopolies, comes with a startling number of hidden economic as well as political costs. Many organic and small farmer organizations even question whether, when all these hidden costs are taken into account, large factory farms are really as efficient and productive as they claim to be. One obvious hidden cost of industrial agriculture cited by the UCS is the high energy requirements of transportation—not just of the foods themselves (transporting oranges from New Zealand to the USA, for example) but of the myriad products that go into industrial food production itself. For example, the corn and soybeans that is used as feed for most industrial lifestock—in place of the ordinary grass used by organic ranchers—must be transported from gigantic farms to the ranches. The petroleum-based fertilizers and pesticides used to growth that wheat must, in turn, be transported to the farms, often over long distances. Then there is the energy costs used in industrial farming itself: the enormous combines and harvesters. In addition to transportation, there are refrigeration costs: again, all from limited energy sources. This environmental destruction [of industrialization] has also destroyed the indigenous culture of the hobbits. They have become industrial serfs rather than agricultural freemen. Now, the hobbits depend upon the industrial work they perform at the new mill for their livelihood rather than enjoying the fruits of their agricultural labor. They also crouch in fear before the big government that has taken over the Shire, for this new government controls the mill, the hobbits’ source of livelihood. Once the hobbits are severed from nature, they are severed from their very essence: they are no longer free and fun-loving. Instead, they have become industrial slaves, both to their masters at the mill and to their bureaucratic masters in government. Tolkien and the Distributists did not believe everyone should be family farmers. 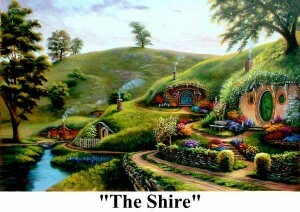 In the Shire, as in the Middle Ages, there were tradesmen, repair men, merchants and lawyers. Tolkien himself was a university professor, Chesterton a newspaperman. Yet they did believe that the “means of production” should be de-centralized, controlled by the many and not by the few. This is in stark contrast to the aims of both Big Government liberals and Big Business conservatives who seek to ensure that the means of production, in this case food production, are controlled by the few. Big Business does this through its relentless quest for monopoly; Big Government does this through myriad regulations that drive smaller companies and farms out of business. “Loathing Capitalism, however, Chesterton loathed Socialism more,” writes the Catholic philosopher Michael Novak of G.K. Chesterton, one of Distributism’s chief theoreticians. “He took his stand on two values which Capitalism claimed to stand upon but, he thought, destroyed: private property and personal self-determination.” Chesterton was one of the few thinkers to see clearly that both Big Business and Big Government want the same thing—total control— and that this is not in the best interests of the average person. This is especially true, we are now discovering, when it comes to the production of food. One of the most troubling aspects of the corporate state’s control over food production is the way in which Big Business operatives infiltrate and control the very government agencies that are supposed to be regulating them. For example, many of the top officials of the U.S. Food and Drug Administration—charged with protecting the health of American food consumers—are themselves former employees of, or paid consultants to, the large multinational agribusinesses. Talk about the fox guarding the hen house! For example, former U.S. Food and Drug Administration commissioner Lester Crawford was actually convicted for lying about his financial ties to companies the FDA regulates (Pepsico). Clarence Thomas, the U.S. Supreme Court Justice who wrote the opinion that the Monsanto Corporation could legally patent its genetically modified seeds, was once a corporate lawyer in the pesticide and agriculture division of, yes, Monsanto. There are a number of practical steps you can take to begin eating more like a Hobbit and, thereby, contributing to both your personal health and your political liberation. Here are a few. 1. Go organic. Whenever possible, begin buying organic food, especially when it comes to meat and dairy products. Organic products are more expensive so every family and individual has to adjust their purchases for their own economic situation. Many people believe that, for health reasons, switching to organic, free-range meats and dairy is more important than organic vegetables because of the use of growth hormones and antibiotics in meat and dairy. 2. Buy local only. Almost every town and city in North America and Europe hosts farmer’s markets where the few remaining family and small farms come to sell locally grown produce. There are now also hundreds of websites where you can quickly and easily identify stores in your area that sell locally-grown produce. 5. Join the Urban Chicken movement. Thousands of families in urban and suburban settings have set up small chicken coops in their back yards, sometimes disguised as children’s playhouses. The fun of growing chickens is heightened by getting dozens of “farm fresh,” organically-produced, nutritious eggs. 7. Lobby for labeling. The industrial food lobby, aided by most national governments, has fought tooth and nail against food labelling requirements. The Big Food lobby has been especially fierce in its opposition to labels for Genetically Modified (GM) foods since so many consumer food products today now contain genetically-altered plants, such as corn. It is also opposed to mandatory labelling for products that contain growth hormones, antibiotics, pesticides and so on. That’s because the food industry does not want consumers “voting with their pocketbooks” and choosing organic foods that do not contain these chemical additives. Those interested in preparing Hobbit foods themselves should consult Emerald Took’s Regional Cooking from Middle-earth: Recipes of the Third Age (Trafford Publishing, 2003). Without access to any modern medicine, the Yanomamo live, on average, to about 75 years of age, mostly in very good health. G.K. Chesterton, The Collected Works of G.K. Chesterton, Volume 5 (San Francisco: Ignatius Press, 1987), p. 20. Robert Hutchinson is the author of The Politically Incorrect Guide to the Bible, published by Regnery. Distributism and the Current Crisis, Part 2: You Say You Want a Devolution?